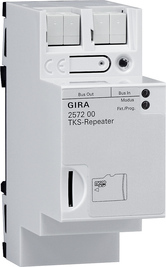 Active component for extending a Gira door communication system with audio and video function. Range extension and increase of the number of devices when using additional control devices. Amplification of the audio and data signals of the door communication system in both directions. Interconnects two line segments, to double both the number of devices in a video or audio door communication system and the cable range. Important: An additional control device is required to supply power to the second line segment. In multi-conversation mode, the complete system is subdivided into several lines (one main line, up to five ancillary lines) interconnected via the DCS repeater. Power is supplied to each line by its own control device. Up to five DCS repeaters can be used in one system in multi-conversation mode. The configuration of the DCS repeater can be backed up to a microSD card. The DCS repeater can also be commissioned without a microSD card. The microSD card is not included in the scope of supply.